MAGUISAspecializes in the slaughtering and quartering of Iberian pork. 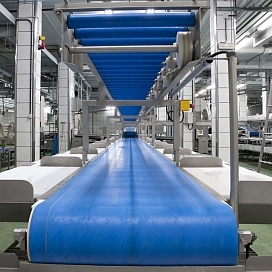 It has a slaughtering capacity of 432,000 kg per day and a surface of 2,280 cubic meters for carcass airing. Pigs are always desensitized before slaughtering as decreed by the legislation in this regard. 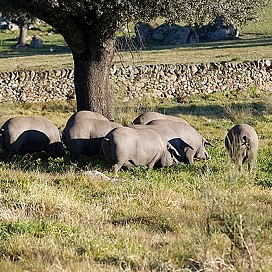 Because of the special characteristics of the Iberian pork, with some of the products aimed to be cured, it is of special interest to apply any improvement in animal welfare issues (rest in the stables, unloading from trucks, stress reduction, application of premortem anesthetic discharge, etc. 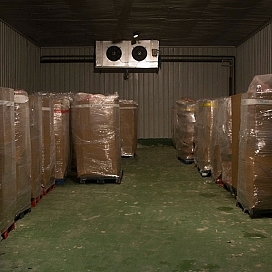 ), since it directly affects the quality of the pieces once cured. 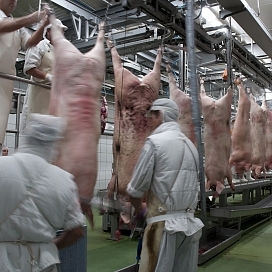 The quartering of Iberian pork takes place in an area of 775 square meters, with a technology whose quartering and production capacity is 216,000 kg per day. There, an efficient air conditioning system guarantees the application of refrigeration to the products while they are produced. The tools are subjected to a process of immersion washing and prescriptive sterilization, using ultraviolet rays and other technologies. 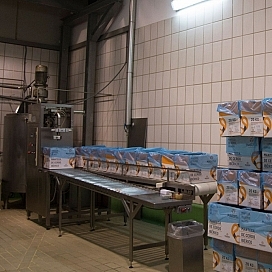 We also have a clean room of 175 square meters with processes of thermoforming, focused on giving the highest sanitary quality and presentation of the different cuts of Iberian pork in formats adapted to each client and country.